OK, so I'm mooning over the Blue Moon Fiber Arts website, obsessively checking my account to see if they've shipped my new Rockin' Sock Club kit (no, "sigh"), and I wanted to mention that some of the yarn at The Fold was stuff I haven't seen on the site. Colorways and fibers. I've only seen the Bliss yarn is snagged in a sock kit BMFA sells. And the Siren Song colorway is not on the site at all. Stalk The Fold, people! And BMFA, of course. What do you think of Lucy in the Sky? Of course I heart "plain" Lucy. I remember Nodding Violet was just as pretty in person. Why didn't I get it? I think panic set in. We'll have to see about going out to visit Grandma again soon. She'd get a shawl out of it for sure. Oh, I've stalled on sewing up Isobel's cardigan. I checked out Twinkle's book at Borders today, and am considering an addition to the knitting book pile. It will just be a matter of figuring out which size to really knit up and possible yarn subs. With almost 150 posts, I'm no longer the latest knitting blog, so I've got a new tagline courtesy of the Yarn Harlot. In her new book, Stephanie Pearl-McPhee Casts Off,* she says "we don't think of ourselves as obsessed, but rather as exquisitely focused in a very narrow direction." And, of course, my direction is knitting with the occasional crochet edge. *The link is to Amazon, but be sure to check your local, independent book store first, if you haven't gotten your copy yet. into these bits and pieces for a picot-edged cardi for Miss Isobel, using the numbers in The Knitter's Handy Book of Patterns. I'm going to use it for a vest for Dad, too. Combined with that little, laminated Interweave Yarn Requirements dealie, I'm all set on basics. Notice anything? One of these things is not like the other. Seems I'm not terribly good at reading neck-shaping directions twice. Oddly, I messed up on the first one. The one where you don't have to reverse the directions in your head. Sigh. There will be a little frogging tonight I think, once we're dry. And then there will be sewing up and a knitted on button band/collar with picots. Should be cute and plenty big for her to wear next fall. In the meantime I'm working on a shawl in some destashed Kidsilk Haze in Dewberry. Not a color I would have chosen in a shop, but working on it is a bit of a revelation, and I'm happy I snagged those two balls. I am now thinking of doing Icarus in three skeins of KSH Heavenly. ... Mist is pretty, too. Well, they're all gorgeous! Anyway, this shawl is basic stockinette worked from center neck edge out and down thanks to four YOs every knit row. My plan is to knit up the first skein, see where we are, and then think up a big edge plan with the second skein. I'm doing this on 4.5mm (US7s - I'm trying to learn the metric system for knitting). Interesting about all the purple, eh? Next up, starting the vest once I get a US4 (3.5mm) circular (and figure out if I want to do stripes on the front or venture into Argyle territory - Dad is a very tall man, so I'm not sure about venturing). Perhaps I should do the Alpaca Silk Opera Gloves, since I have DPNs. Wendy is getting somewhat contemplative about knitting, which brought my thoughts about knitting to the fore. As you know, life has been a challenge for the Purly girl lately. And that has led to a LOT of knitting: Since January I have knit two sweaters for myself, two shrugs, a pair of men's socks, a pair of gloves, a hat, a purse, a shawl, a shawlette, along with starting another sweater for me, another shawl, a sweater for Isobel, and a vest for Dad. And most of those items are not in bulky yarn. We're talking many, many stitches. Now, I can't say each one is a prayer or anything, but I have found knitting to be a life-saver. With knitting I've found something to concentrate on other than my situation. Creating stitch after stitch is meditative, though I don't think of knitting as meditation in the strict sense of the word. And working out a new stitch pattern or reworking a size stretches the mental muscles - mine have been getting stuck in some yucky grooves lately, so adding a picot edge to Isobel's cardigan helps to break me out of that groove. People have been saying for a few years that "knitting is the new yoga". I know what they mean, but isn't that a facile comment? Knitting is knitting, and yoga is yoga. The two share some elements, requiring us to focus on something both inside and outside of ourselves. Modern folks have a tendency to navel gaze (see "yucky grooves"), don't we? Knitting is very personal, but it can also be communal and generous. Yoga is, of course, navel gazing in the name of health. Breathing is central. And shouldn't we all breathe while knitting? Repetition is important in both practices and leads to increased flexibility and more even stitches. Remember your first knitted item? I still have the "scarf" in my stash, though some day I might frog it and do something else with the yarn (turquoise Manos del Uruguay - I believe in using the good stuff all the way). Remember your first yoga class? Luckily, I've always been flexible, as I started practicing ballet at age three, but I had no idea what I was doing! Now I can do Downward Dog properly and sometimes achieve a Headstand (what a rush!). Next time: "Crochet is the new Knitting," "Grey is the new Black," and other brilliant observations. Just kidding! How beautiful is the Lucy colorway from Blue Moon? What do you think of an Icarus shawl in the Geisha yarn in Lucy? Oh, kid mohair and mulberry silk, you are temptation! Really, it could be anything in that yarn, but I have the Icarus pattern burning a hole in my workbag and am on a shawl kick, as you know. Personal life isn't so great, though work offered to keep me on the payroll until May 11th, which is helpful. Luckily, the weather is glorious here, and Mom is back from her trip, so we're off for a walk at the Botanic Garden. Dad isn't the best photog for the knits (look, ma, no hands! ), but I thought you'd like to see this from the front. See how it's a little sheer? I'm wearing a v-neck t-shirt underneath. It's OK, though, I don't mind. Have I mentioned that I love this yarn? The sheen of the silk. Yum. Many thanks to Suzanne N. for encouraging me to look at sock yarn in a new light. The pictures are of Mom modeling her new shawl. I used Cherry Tree Hill Supersock - a lovely colorway reminiscent of Monet's Waterlillies. Since I ran out about ten rows from the end and the shop didn't have another skein of that color, I ended up using a complimentary purple mix for the last ten rows and the crochet castoff. Can I just say I love casting off with a crochet hook?!? Wow, so much faster than the picot castoff I did on the Kidsilk Haze shawlette. The pattern is from an old issue of Interweave's Needlework - Old Shale Shawl by Evelyn Clark. It came out really well despite me losing the stitch count a few times. I do need to re-block it now that I have two packets of blocking pins - I couldn't pull out all the points this time around, since I was running out of time to give it to Mom before she went on her trip. 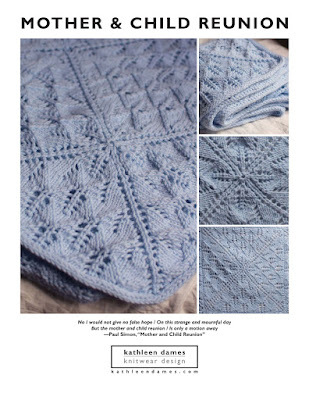 I have the yarn called for in the pattern (Misti Alpaca Lace), so I may do another one, though I'm also interested in upping the level of knitting. And then Clara goes and writes up her recipe for shawls, so I may wing it with a lacey stitch pattern from my Mon Tricot. I'll keep you posted! So, the best way to visit the Fold is not to arrive fifteen minutes before closing with an over-tired toddler and your indulgent but not-interested-in-the-fiber-arts father. Thank goodness I don't spin (yet) or I would have gone off my nut completely. The bags of fiber looked scrumptious. But it was the selection of Blue Moon fibers that overwhelmed me. If you want pics of the Fold itself, be sure to check out Amy's post. Who knew she was so close by for a moment? I haven't seen her in person since she was touring for Knit Wit and came to Circles in JP back in the day. If she should come your way, be sure to see her, if you can. She's another charming, Canadian knitter, and you know they're good people. Here's the sweater in action on Easter. Sorry I don't have a full shot yet but I didn't think to get one. Love the color, love the fabric, love my mods to the pattern. I am quite happy, though I think it needs some more blocking. It's a little sheer, so I wore it with a similarly shaded long-sleeve shirt because it's so blasted cold here in the Chicago area this April. I mean, it snowed today! And the snow is still on the ground. I don't even have the heart to photograph it, it's just so ridiculous (and wet and not very photogenic). Thank goodness I'm a knitter! At least I brought Isobel's hat/scarf/mittens set and my Malabrigo gloves. I'm working on a beret from Greetings from Knit Cafe in some of the leftover Alpaca Silk. There should be enough also leftover to make some long gloves for next winter. But guess what?!? I think we're going to stop at The Fold on the way to visit my Grandma on Saturday! Home of lots of Blue Moon Fiber Arts yarn! I'm anxiously awaiting my next STR club shipment, even though I haven't done up my Monsoon socks yet, since that yarn is in the boxtobeshipped. Since my stash is in cardboard, I'm working on acquiring a new stash by checking out some of the new "local" yarn stores. There will be a full report later. Oh, she was great. Charming, self-deprecating, funny - your typical Canadian. I won't say Stephanie is "cute", since she exhorted us all to reject folks calling us knitters cute. So, instead I'll say she is attractive and very personable. I don't think the cover of the new book does her justice. The Bohus was gorgeous and inspired many in the 200some crowd, I'm sure. Franklin was there, I believe, but I didn't have a chance to introduce myself as my BFF and I were turning into pumpkins by the time I got my book signed. I have a very blurry picture since I haven't figured out how to control the autofocus on the Fahncy camera, and I wouldn't want to post a picture on my blog without asking him. 'Twould seem something like an invasion of privacy. Anyway, here I am with Stephanie, her sock, and the start of my Old Shale Shawl. Thanks, Stephanie, for a most enjoyable evening! Speaking of socks, I'm going to see the Harlot tonight! I even volunteered to be hat coordinator here, since no one is yet listed on the Represent page (scroll all the way down for other coordinators). We'll see. Something to keep me busy and get me involved in the area fiber (fibre?) community. I just have to remember that it took time to find Yarns in the Farms (Hi, Goddesses! ), so I need to be patient. I did find another LYS not too far away. The Village Knit Whiz in Glenview seems nice, has a good yarn selection, and even had some toys for Isobel to play with. Just wish the lighting wasn't fluorescent. I'll have to work on it :) They had quite a lot of yarn, from Artyarns to Colinette (not just kits) to Malabrigo, as well as lots of "standards" (various Dales, Encore, etc.). It was perilously close to Isobel's lunchtime, so I wasn't able to acquire anything, but I have my eye on some variegated Artyarns Supermerino in a green/blue (surprise!) colorway. No idea what to do with it, which is the other reason I didn't buy any. How much would I need? Speaking of yarn acquisition, my dear Yogabud asked about moving the stash. It's in a big cardboard box in Gloucester at the moment. I only grabbed a few skeins when I packed our suitcases. So, there may have to be some SABLE here. Luckily, there is a sale tomorrow at another LYS, Three Bags Full, that my mother's friend told me about. I'm closing in on the end of the Mermaid Sweater (yes, I've been knitting like a fiend) and am trying to decide if I should repeat the lace pattern at the neckline. I think so, since it might seem odd if it just ends. I'm worried about there being enough structure at the neckline to hold everything up. The turned hemline at the neck definitely adds support.